Please tell me that you’ve gotten out and enjoyed the beautiful weather that we’ve been having lately! (Hope it’s beautiful where you are because it’s been wonderful here!) We’ve had way to much cold and yuckiness, I need sunshine in my life! Today was one of those beautiful days that just screams that spring is right on top of us! Big Bear went out and worked on our flowerbeds today and I opened all of the windows in the house and cleaned from top to bottom. I’ll take a few more days/weeks like this please! Along with beautiful weather, these last few weeks have brought on another chapter in the Barrett household. We’re really stepping it up this time and actually, truthfully working on our eating habits. No more diets, no more cutting out carbs or whatever, no more aiming to loose weight. Our goal? Eat better, be healthy, stay active and anything that comes from that in the form of weight loss is just a huge bonus. So far we’ve done pretty good. We’re eating a ton of vegetables and we’ve been adding more protein to our diets. I’m also snacking on fruits and I love having them in the house now. BigBear still isn’t to much into the fruits but I hope that we can change that! Hey, I’ve gotten him to eat broccoli and spinach haha, I should be able to get him to eat some fruit, right? I mean come on, what’s not to love about blackberries, strawberries, bananas and kiwis!! Plus the bright colors of these fruits just scream “SPRING! !” to me. Foods like fruit make me WANT to eat healthy. Like my friend Anne keeps telling me when it comes to junk food, “It’s easier to say “I don’t want” that than to say “I can’t have that”. I am finding that so true. I am finding that I am looking at candy and sweets and saying “I don’t want that” and looking at fruits and saying ” I do want that!” It’s a great feeling too. I’m still working on recipes and whatnot but there will be a change going on around the blog too, since I do blog about what we eat. 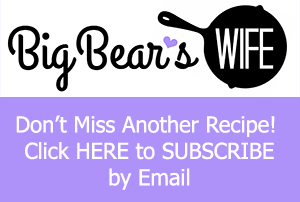 I’m seeing less junk on the blog and more yummy “good for you” recipes in my future. Now, I’m not saying that I want to totally give up everything, but we’re just going to be changing the way we view food from now on. I have noticed that with eating better that when I do eat junk that my body flips out. So I might be giving up more than I want to haha. My body is rebelling against junk now. Ahhh what will become of my chocolate addiction. I’ve already banished diet sodas lol. Ps. I think that blackberry and kiwi is my new favorite fruit combination! In the bowl of a stand mixer (or use an electric mixer with a regular bowl), mix together the cream cheese, yogurt and honey. Mix for a few minutes until combined and smooth.Carefully fold in the cool whip. Place into the fridge. In a medium bowl crush the vanilla wafers. Add in the melted butter and stir until combined. Place 1 tablespoon of crumbs into each mini muffin cup. Press down with the back of the measuring spoon or use a tart former to make a it into a mini crust. Bake at 350 for 8-10 minutes. Remove from oven and let cool. Once the tart shells are cool start to assemble the tarts. Spoon a little of the cream cheese mixture into the tarts or fill a sandwich bag with the cream cheese mixture, cut one of the tip off and pipe the cream cheese mixture into the tarts. We’ve got some more great recipes to share today that are all about spring! 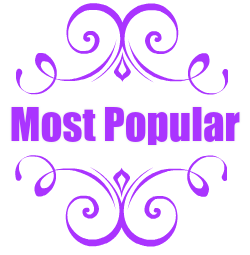 I’m linking to Tidy Mom’s I’m Loving It Link Party! Oh, my Angie. 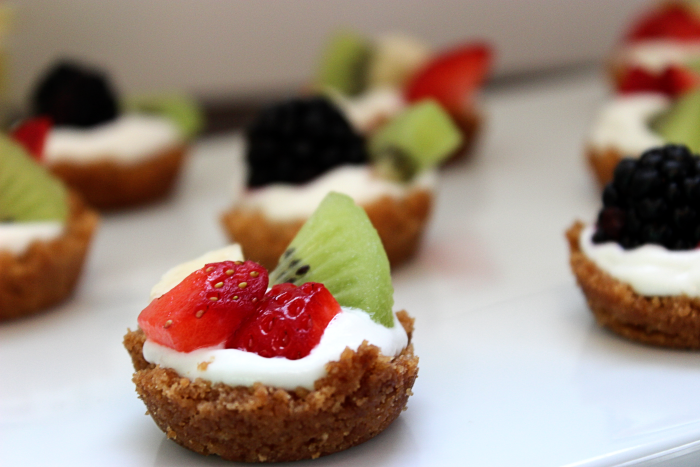 Your fruit tarts – like all your food – looks and sounds sooo good. Do I still dare make fruit tarts for next week? Well, I’ve got a week to decide. Seriously, your lovely gems take the cake! Oh, I really wish that I could say spring has arrived in New York. Alas, winter is holding on by its teeth. Grr. 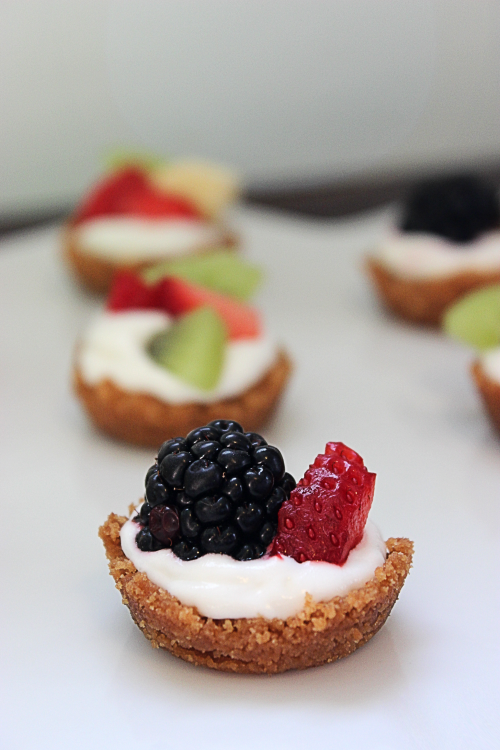 These little tarts are so cute and the size is appropriate for more sensible snacking. Good luck in your new plan. Every healthy change helps. Love the perfectly refreshing little bites you created! Delicious! Looks delicious! I also love blackberry and kiwi together too! I just love your little tarts! 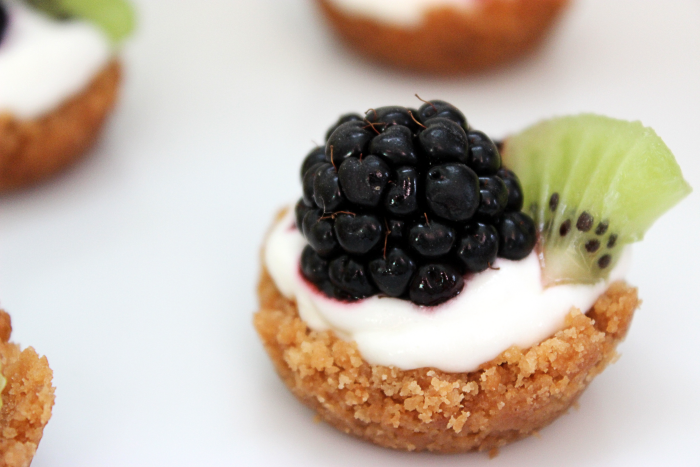 Mmmm…these gorgeous mini tarts won’t break the diet! I can’t wait till we can open our windows…there’s a “wintery mix” in our forecast…ugh. So beautiful! Love your “eat better, be healthy, stay active” attitude. These look amazing! I love the fresh fruit! 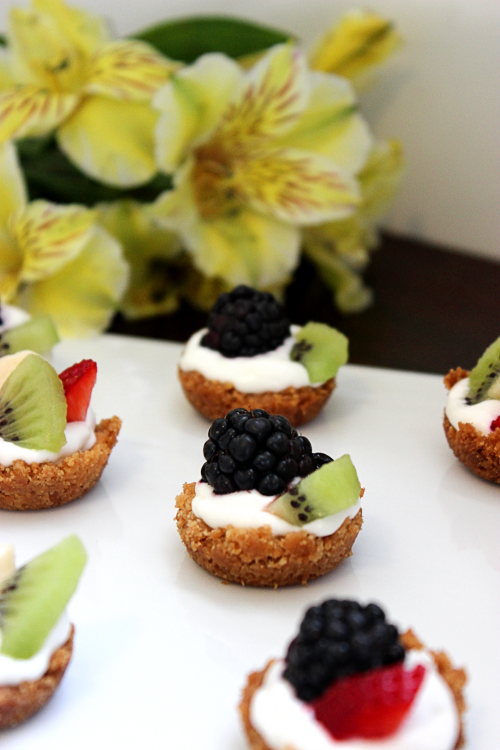 Your fruit tarts are beautiful! I will have to try out the kiwi blackberry combo. Sounds awesome. Yum! 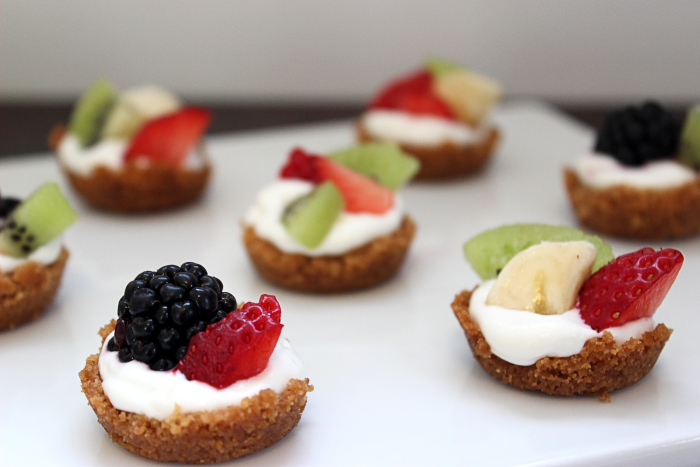 I love fruit tarts but I’ve never had them in vanilla wafer crust-that looks so good! I want to get in the kitchen and make them now! I think those are great goals – there has to be a balance between healthy – real food we eat, and activity. I’m looking forward to being able to be outside more and being more active after we move. That is the only downside to 8-9 months of winter…being stuck indoors so much. Angie, those look so dainty and sweet. Good for you for making healthful changes. I’m trying to do the same with so so results. Enjoy your good weather! These are so pretty, and I love that crust. I’d eat all of them, which would probably not be good for me. LOL! Oh vanilla wafer crusts sound yummy. Seriously kiwi is my all time favorite fruit… YUM! I LOVE kiwi. I really love all fruits haha, but kiwi is one of my favs! Today the sun finally did peak its head out but we have had the most rubbish weather and everyone is feeling very down about it. I bet something as cute and tasty as these would perk my co-workers up. Hope the sunshine comes out for you soon! 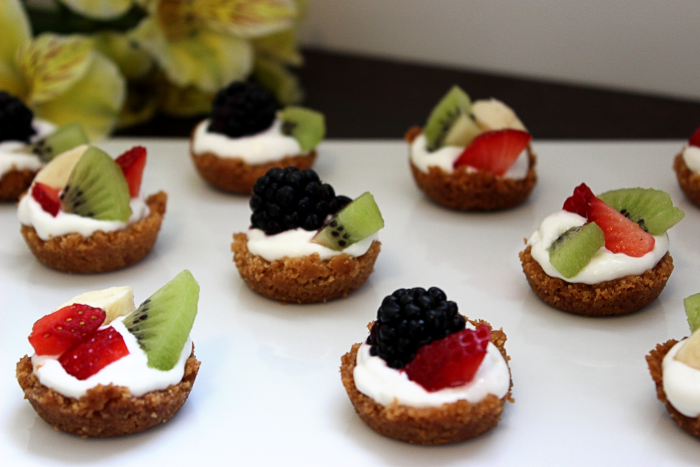 Gorgeous gorgeous looking mini tarts! 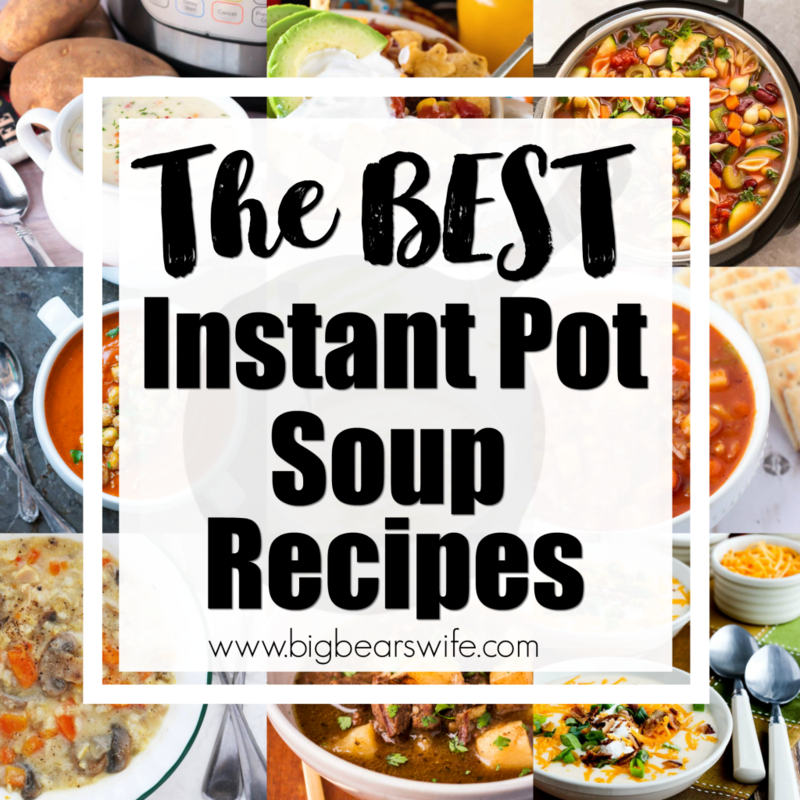 !I love how easy they are and healthier too 🙂 Perfect for spring! Your filling recipe is so much better than mine. I’m jealous at how fabulous these look! oh my goodness Angie! 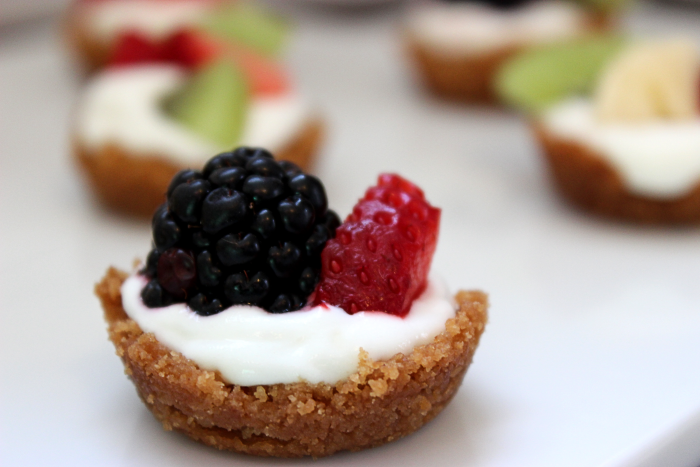 These mini tarts look great! yum! I love that you used Nilla wafers for this! I always have some in the pantry! 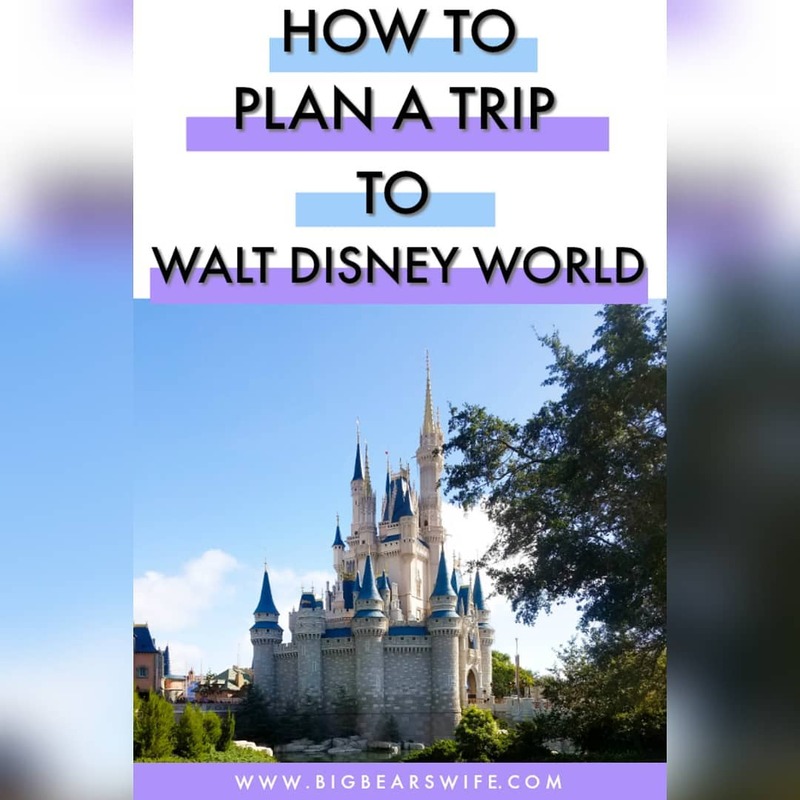 totally going to try this! What sweet little tarts! I love how you incorporated yogurt into the filling; I’ll have to try that next time! These are absolutely gorgeous. 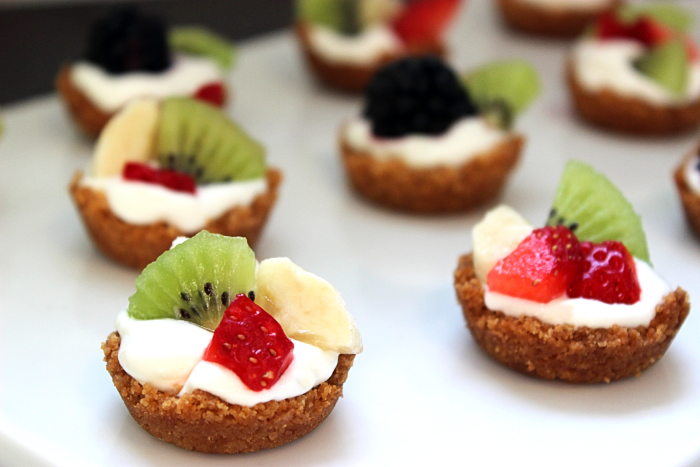 I love fruit tarts and I love mini ones even more. The filling sounds perfect. 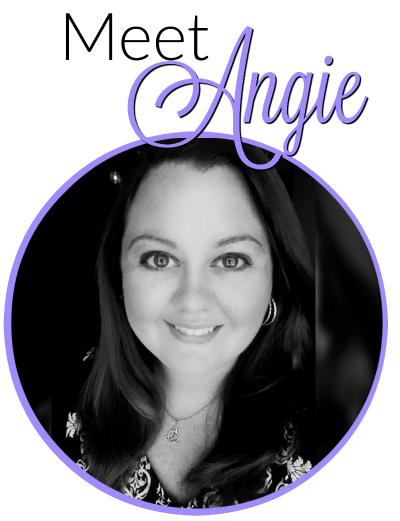 Good for you, Angie! That’s the right attitude – to not go on any fad diets or do anything crazy. I’m totally looking forward to your “better-for-you” recipes. 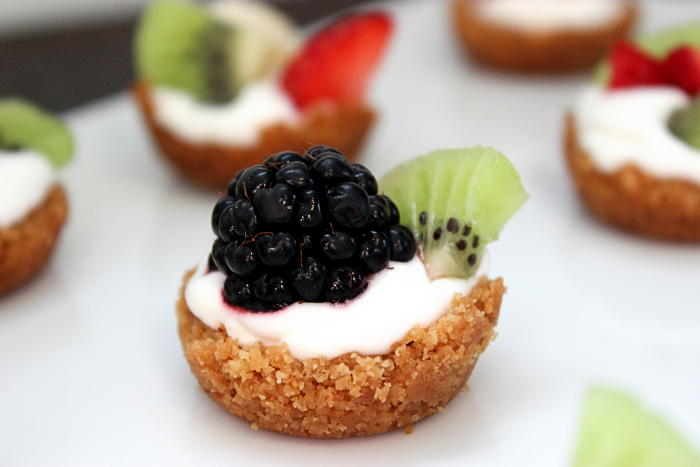 As for these tarts – they’re adorable! 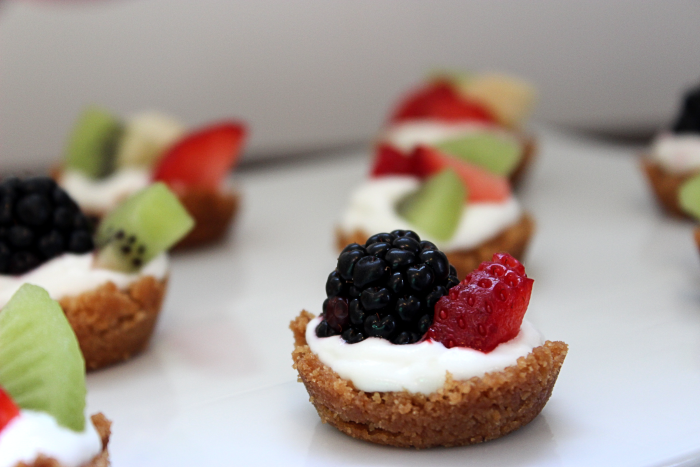 I love fruit tarts so much, I could totally see myself inhaling this entire batch. I love your photos too – they’re gorgeous! These are so cute! And I love blackberries. I bet they are delicious paired with kiwi! They are perfect with the Kiwi! 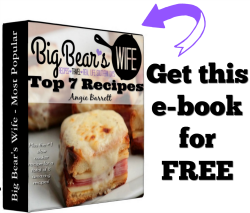 These are on my must try list, Angie! too cute!! it’s like you could pop this into your mouth so quick that they don’t count! these look fantastic Angie!! thanks for linking up!